Our process, services, and clients are a cut above. We take a strategic approach to marketing from start to finish. How we work, the various marketing services we offer, and the results we deliver for our clients all depend on it. OUR UNIQUE PROCESS MATTERS. FOR EVERY CLIENT & PROJECT. Marketing 101 teaches all about the 4Ps of marketing. Product, price, promotion and place … all very important. But intelligent marketing is about something more. It’s about the people behind the strategy, plans and tactics. And as those people, we have our own guiding principles for how we work. At TRG Marketing, we are committed to our own 4Ps. A true extension of your business. Clients work with us not just because we are smart about their marketing. They work with us because we are also smart about their specific business. Decades of experience has provided our team with a wealth of knowledge in multiple industries and business structures. And it’s experience that cuts a wide path for both B-2-B and B-2-C firms, companies and organizations. Everyone says they’re different. We mean it. At its core marketing isn’t about fancy parties or clever slogans. It’s about creating business value. That’s why we listen well, anticipate needs and take a business-focus approach to our services. We attach recommendations to real business objectives and are thoughtful in leveraging campaign resources to the greatest extent possible. And at TRG, the Golden Rule applies. Always. We aren’t in this business for the fame, fortune, or personal glory. Yes, it puts food on the table, but truth be told, we do it because we love it. The satisfaction we get, working together with clients to achieve the growth and results they so richly deserve is second to none. That invested camaraderie motivates us to succeed on their behalf. Intelligent marketing drives sustainable growth. It’s not a catchphrase, it’s the truth. And intelligent marketing comes from having a proven process in place that accounts for the many variables that can affect the results of a campaign. Because we pinpoint leading factors impacting our client’s bottom line, we are able to deliver smarter campaigns designed specifically to increase business value. FRESH PERSPECTIVES. SMARTER STRATEGIES. RELIABLE EXECUTION. TRG Marketing helps clients identify their place & potential in the marketplace. We develop practical action plans that capitalize on client strengths and play to their most receptive audiences. And yes, we are a full-service marketing firm. 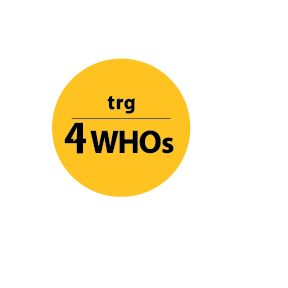 The TRG team is well-versed in each of our four major areas of expertise – the 4DOs. TRG helps organizations take the next step forward. We identify the highest areas for growth and profitability and develop effective business strategies that connect our clients with their “best fit” customers. We understand the best practices behind effective sales strategies. And our mix of market analysis, strategic messaging, and tactical planning offers clients a blueprint for sustained growth. Technology is always evolving. So should yours. If your organization is not at least on par with the competition with respect to the latest trends in web design and user experience (UX), social media usage and other electronic communications, you’re putting both your reputation and your business at risk. TRG’s e-valuation services allow us to review your current e-state and offer solutions for improving your technology footprint. Simply put, customers have to know that you exist. TRG has a long history of helping clients raise their profile within their industry and the greater business community. Well-conceived media plans, affordable advertising campaigns, creative piece of direct mail, and smart pieces of collateral can all make a difference. Our team develops practical plans to get you noticed and put your message in front of those who matter most. It’s critical for your brand to both look and act the part. Everyone should have the same understanding of who you are and what you do. Action and feeling are inspired from the specific words you say, the look and feel of your website, all the way down to the business cards you hand out. TRG hones in on the characteristics and points of difference that define their organizations. Then we develop tools that best express those unique qualities. MARKET KNOWLEDGE OF VARYING INDUSTRIES, CULTURES & ORGANIZATIONS. TRG Marketing proudly partners with some of the most trusted businesses and organizations in Wisconsin and Illinois. Our clients range from 20,000+ international membership associations to local award-winning technology companies. We’ve steadfastly served various law and architecture firms and industry-leading manufacturing and insurance organizations. We’ve helped family-owned communications businesses, innovative healthcare administration companies and national distribution outlets. Among TRG’s 4WHOs, the list is strong, varied, and growing. And each one means something special to us.